William Jewell College was founded in 1849 as a private liberal arts institution. Since then, Jewell has been known to provide a liberal arts education “unmatched in the Midwest.” In 2017, Forbes magazine ranked Jewell as the #177 liberal arts college in the country. Despite these accolades, in July 2016 Jewell initiated a Brand Mission campaign, led by new president Dr. Elizabeth MacLeod Walls, to improve the institution. This article is the first installment in a series highlighting the key players and dimensions of this campaign. The Brand Mission began with an intensive period of data gathering and analysis. Jewell partnered with Kurt Bartolich, Founder and Brand Internalist at Gutsbranding, who led a series of focus groups and panel sessions to identify fundamental elements of the Jewell experience. Each of these sessions focused on a different constituent group. These included faculty, staff, donors, trustees, students separated by year and roles on campus and employers in the Kansas City area. These sessions collected qualitative data to identify Jewell’s desirable aspects. Data concerning Jewell’s Net Promotor Scores (NPS), an index ranging from -100 to +100 that measures the willingness of customers to recommend a company’s products or services to others, was analyzed to assess students satisfaction. This process generated and analyzed 2,500 responses. The qualitative data obtained was used to identify three pillars of the Jewell experience: critical thinking, community and meaning. These were synthesized to formulate the Jewell Philosophy, “critical thinkers in community pursuing meaningful lives,” a statement intended to encapsulate the Jewell experience and ideology. The Jewell Philosophy then guided the Branding Mission’s next steps. In late 2016, Jewell partnered with Jason Parks, 1998 Jewell alumnus and Managing Director at Barkley, a marketing firm based in Kansas City, to design marketing materials and a campaign reflective of the recently established Jewell Philosophy. Campaign strategies include billboards erected in the Kansas City metropolitan area, a redesign of the Jewell website, paid social media advertisements and a Branding booklet. So far, the cost of this campaign has been $1.1 million, all of which has been fundraised. However, the remaining costs are expected to be lower than those of the past 12 months as certain expenses, such as the website redesign, are not recurrent. Beginning fall 2018, the expenses will be incorporated into Jewell’s annual budget. To achieve this, MacLeod Walls has adapted the budget structure to include funds specifically allocated for marketing and outreach. 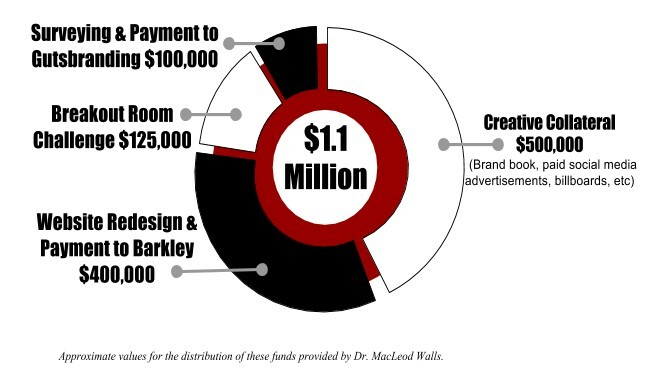 “We had not historically put marketing dollars in our budget, hardly at all, which is something that I changed very quickly after arriving,” said MacLeod Walls. As well as increased engagement with the external community, the Branding Mission has catalyzed change on campus. The Mission identified positive and negative aspects of the Jewell experience, and this information has informed recent policy changes. The Branding Mission is also being used to inform other changes on campus, including residential hall and Mabee Center renovations, access scholarships to increase diversity on campus and endowing the Oxbridge and music programs. According to MacLeod Walls, no staffing changes have been related to the Brand Mission. Responses to the Brand Mission have been positive, with faculty and alumni showing the most enthusiasm for the campaign. The one constituent group which has not had an overall positive response is current students, who are generally skeptical about the project. Despite being aware of student skepticism, MacLeod Walls is pleased with the internal community’s response to the Branding Mission. The quantitative data reflects MacLeod Wall’s optimism and shows increased NPSs overall and within constituent groups. Last October, the average NPS across all students was -13 percent, the NPS of student athletes was -16 percent and non-student athletes’ NPS was -12 percent. This October, the average NPS score had increased to +2 percent, that of student athletes increased to -7 percent and that of non-student athletes increased to +7 percent. MacLeod Walls hopes that eventually the overall NPS will be +10 percent, though there is no established timeline. To monitor progress, Bartolich will continue to survey relevant constituent groups. The next round of surveys will be conducted this winter. Groups to be resurveyed are alumni, business leaders, faculty and staff, including athletics, and leadership. According to MacLeod Walls, the Brand Mission, particularly marketing, is being implemented through four pillars. These are getting noticed, recruiting, reassuring (staying true to the Brand Mission on campus) and retaining. These apply for both potential students and potential investors. With these four pillars in mind, the Brand Mission success will be assessed by the level of engagement the external community has with Jewell in the years to come. The results of these assessments will be used to inform future marketing decisions. Regardless of what the outcomes are, current Brand Mission products will remain central to Jewell for the foreseeable future. “I’ll never say that the Branding Mission has failed because the Jewell Philosophy is the Jewell Philosophy,” said MacLeod Walls.